Dwarf snapdragons are easy to grow from seed and are best grown in masses as bedding plants. The spikes are too short for cut flower arrangements. Flowers may be classic (having two puffed petals that look like stacked berets) or azalea-flowered (fringed or ruffled). They often overwinter in protected areas up to Zone 5, and bloom best in cool weather well into fall. Prefers light soil high in organic matter. A short-lived perennial grown as an annual. First-year plants may overwinter with protection in Zones 5 to 7. May be single-colored or bi-colored. The flowers are clustered on short spikes. Propagate by seed - Start seeds indoors 6 to 8 weeks before the last spring frost. The seeds need light to germinate. Plants tolerate frost and grow best in cool weather, so you can transplant them outside before last frost date. Pinch tips when plants are 2 to 4 inches tall to produce compact plants with more flowers spikes. Deadheading flowers as they wither and go to seed will encourage plants to produce more flowers later in the season. �Floral Showers� Series: 5-inch tall plants with 12 different flower colors, 4 of them bicolors. Performs well even in heat. �Montego� Series: early flowering 8-inch tall plants with flowers in shades of red, white, pink, yellow and purple, as well as bicolors. �Magic Carpet� Series: 6-inch tall plants are spreading and attractive. 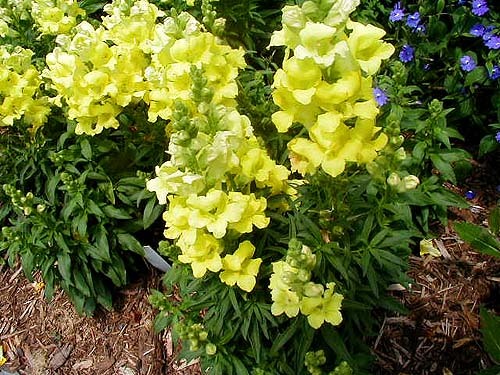 �Bells� Mix produces 8-inch tall plants that have long bloom periods. �Little Darling� produces 12-inch tall plants with flowers in shades of red, pink, yellow, white, and purple. �Sweetheart� produces 12-inch tall plants that are wind tolerant and have flowers in shades of red, pink, white, yellow and purple. ©2006 Cornell University. All rights reserved.